Bank reconciliation is the process of making sure that the records held in your accounts match those held by your bank. By reconciling bank accounts – sometimes known as a ‘bank rec’ for short – you are able to check that your cash records are accurate and can avoid any issues with overdraft fees or charges for missed payments. You might also be able to spot instances of fraud. 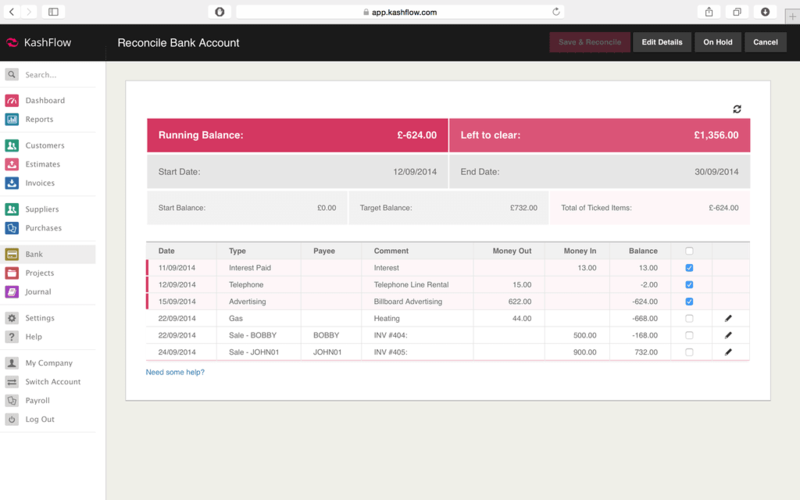 A bank reconciliation is typically carried out once a month but you can do this whenever you like – and as often as you like – in order to be sure that your accounts and bank statements are in line with each other. The following guide shows you how to perform a bank reconciliation in a quick and easy way with KashFlow. 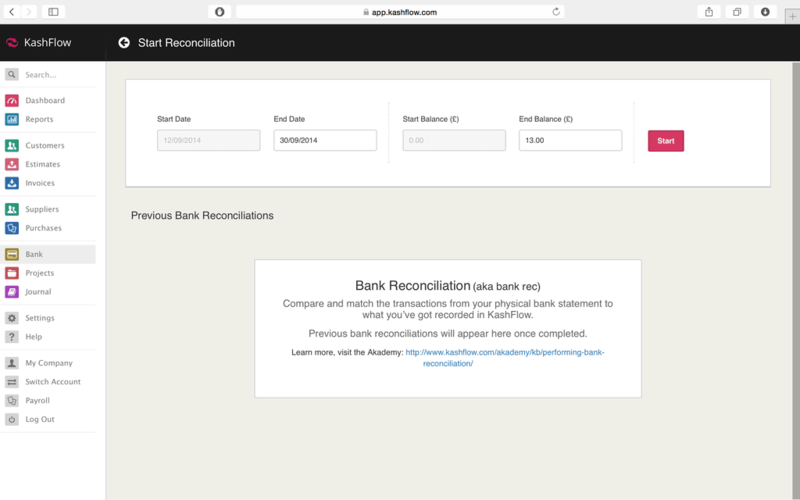 A bank reconciliation can be done by going to Bank > click the Reconcile button, you’ll require your online or paper statement in order to cross check the information there with what is currently on KashFlow. Bank account start date – if you’ve not reconciled before then the bank account start date will be the first day of the reconciliation. 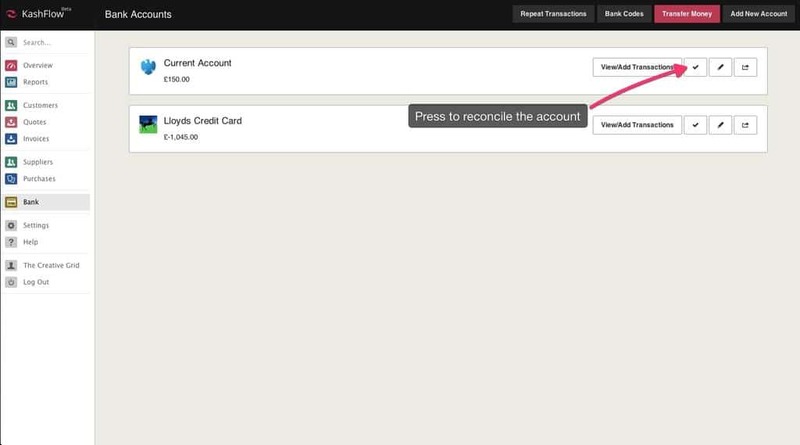 You can see the bank account start date by going to Bank > Edit Details link next to the account > Start date. Reconciliation date – if you’ve just moved over to KashFlow and have been using different accounting software previously, then you’ve probably reconciled before. You can set the date for your previous bank reconciliation by going to Bank > Edit Details link next to the account > Set the reconciliation date to the date that you previously reconciled up to, the start date will be the day after this. Start balance – this is the balance that’s recorded in KashFlow as the opening balance on the start date. You can see the balance that is recorded here by going to Bank > View/Add Transactions > Looking for the last transaction on the date before your start date, this is the opening balance of the start date. End date – this is the date that your statement is dated. The statement date is the last date of any transactions on your statement. End balance – this is the closing balance at the end of your statement date. When you’ve entered in all these details just click the Begin button, or Resume if a bank reconciliation is already in progress. You will then be taken to the reconciliation screen. Total of ticked items – this is the net value of the items you have ticked so far in KashFlow. Below that you’ll see your list of transactions that you can compare with your paper/online statement and tick off one by one. The amount and date should match perfectly. After you have ticked off all transactions that appear your reconciliation, the details should show that £0.00 is left to clear and the Save & Reconcile button will then appear enabled. If you would like to leave this reconciliation and save the items that you’ve got ticked at the moment to return to it later just click the On Hold button. You can resume this reconciliation later by going to Bank > Reconcile > Resume. If you would like to cancel and delete this reconciliation click the Cancel button. Any transactions marked as reconciled will be reset to unreconciled. As you’ll have seen, this is a straightforward process, and allows you to make sure that the records kept by you and the bank match.